(Nanowerk News) Researchers succeeded in creating an electrocatalyst that is needed for storing electric energy made of carbon and iron. Platinum has traditionally been used as the electrocatalyst in electrolysers that store electric energy as chemical compounds. However, platinum is a rare and expensive metal. Now Aalto University researchers have succeeded in developing a substitute to it that is cheap and effective. "We developed an electrocatalyst that is made of iron and carbon. Now the same efficiency that was achieved with platinum can be obtained with a less expensive material. Nearly 40 per cent of the material costs of energy storage with an electrolyser come from the electrocatalyst", says senior scientist Tanja Kallio. 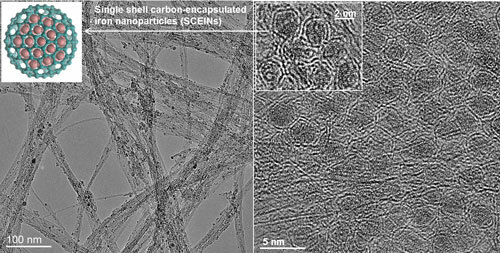 The findings have just been published in the scientific journal Angewandte Chemie on 12 February 2015 ("Single-Shell Carbon-Encapsulated Iron Nanoparticles: Synthesis and High Electrocatalytic Activity for Hydrogen Evolution Reaction").